Halloween is coming so it’s the perfect time to do a fun unit study on those spooky nocturnal mammals – bats!! 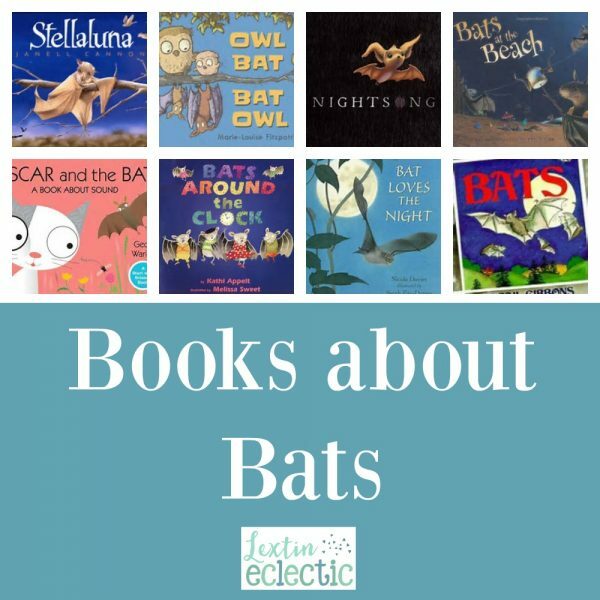 Here are some of my kids’ favorite bat books to celebrate! They live in spooky caves, in forests, even in the dark reaches of ordinary attics and bridges. They flock by the hundreds, and they sleep while hanging upside down! Read all about bats and their amazing abilities. Bats fly into the spotlight in this exploration of such basics as where the live, how mothers raise their pups, and how they hunt for food. While out searching for food, fruit bat Stellaluna and her mother are attacked by a vicious owl. Stellaluna is separated from Mother Bat and taken in by a family of birds where she must put aside her bat habits to fit in with her new family. Night has fallen, and Bat awakens to find her evening meal. Follow her as she swoops into the shadows, shouting and flying, the echoes of her voice creating a sound picture of the world around her. With these words, Chiro’s mother sends him off into the night for the first time alone. It’s an adventure, but how will he find his way? From blood-sucking vampire bats to mango-eating fruit bats, this book tackles bat myths and teaches children about: the bat family tree; their bodies; bat communication; how they fly, sleep, eat, and reproduce; and, their role in nature for pest control and plant pollination. Put on your dancing shoes and get ready to boogie! It’s American Batstand – a twelve-hour rock and roll extravaganza with Click Dark as your host. A mother owl and her three little owlets live happily on their branch. That is, until the bat family moves in. The newfound neighbors (owls up top, bats hanging below) can’t help but feel a little wary of one another. But babies are curious little creatures, and that curiosity, along with a wild, stormy night, might just bring these two families together.